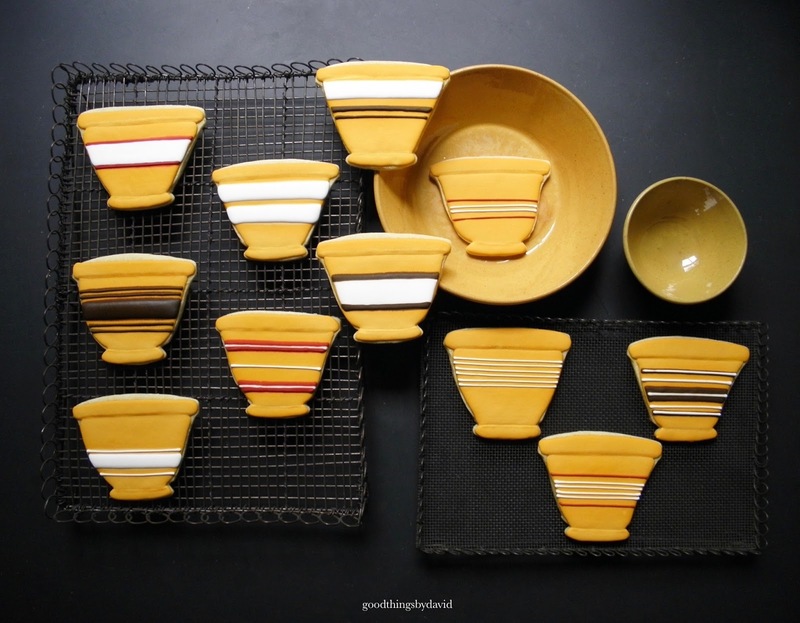 It's no secret that I love yellowware mixing bowls and that I collect them whenever I find any in good condition. They are used in my home throughout the year as decoration, for holding fruits and vegetables on the counter, and for blog posts whenever I have the chance to showcase them. During the Fall season though, they are used a lot more than at other times because of their beautiful earth tones. Yellowware bowls in the form of cookies though? Absolutely! 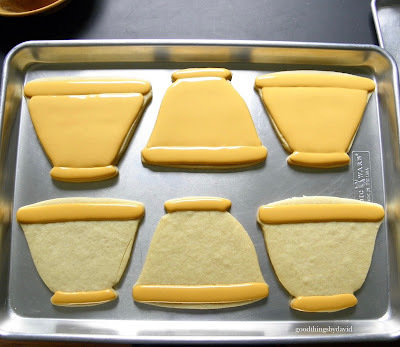 I had been wanting to make sugar cookies in the shape of mixing bowls, and as much as I searched online for cookie sources and inspiration, I couldn't find any! How is it that no one has iced and decorated mixing bowl sugar cookies? 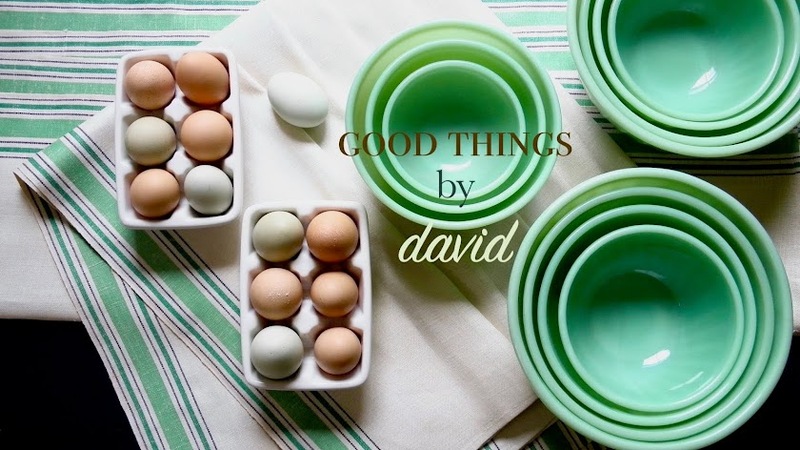 It doesn't help that there really aren't any cookie cutters on the market suitable for cutting out forms that resemble big mixing bowls from yesteryear (Help @coppergifts!!!). Suffice it to say that I had the perfect temporary solution. 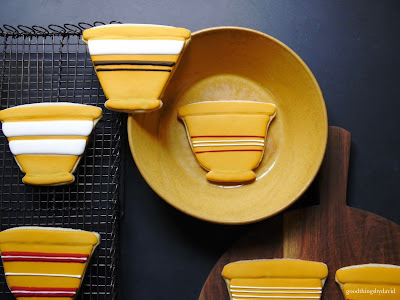 Using a vintage Martha by Mail cookie cutter meant to create teacups, I cut out and fashioned big mixing bowls for this project. 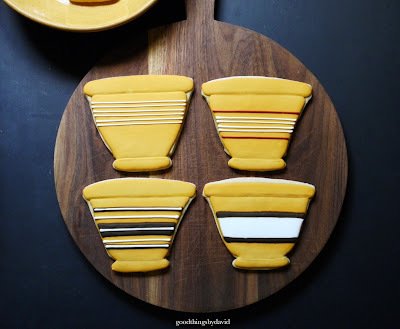 Let me show you how I made my yellowware bowl sugar cookies. This teacup shape is from the Teacup and Wedding Cake cookie cutter set that was once sold through Martha by Mail. 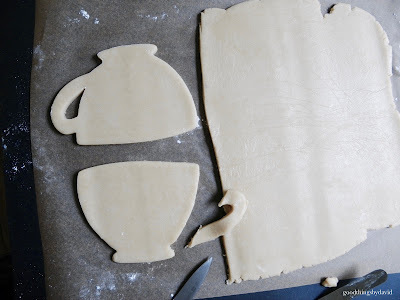 The giant copper cookie cutter had that beautiful footed base and wonderful bowl shape that I was looking for, and the only thing getting in the way of what I wanted was the handle. 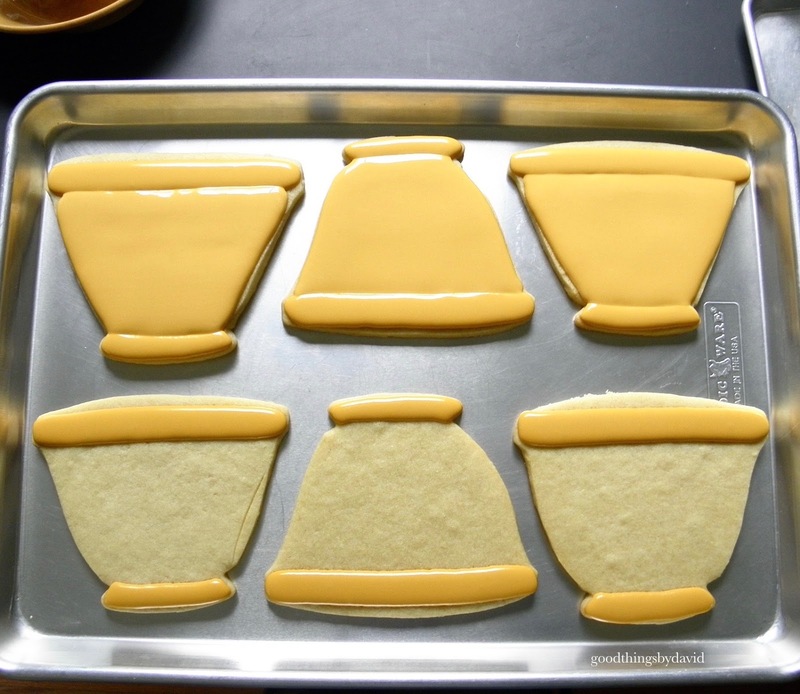 After rolling out the perfect sugar cookie dough, I began to cut out my shapes. The handles were then sliced off with a sharp paring knife (above). 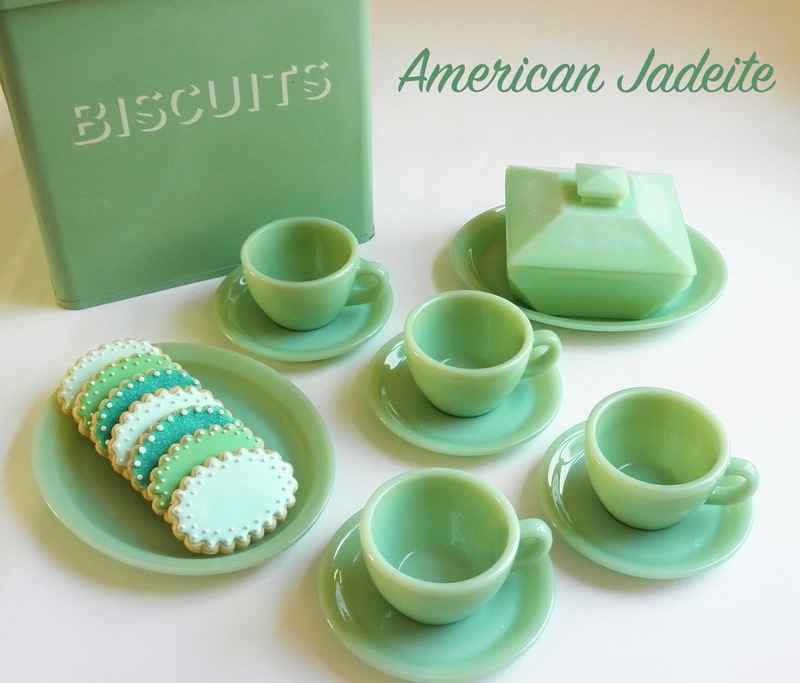 At this point the teacups resembled cafe au lait bowls (another great idea for royal icing cookies! ), so I had to further enhance their shape. 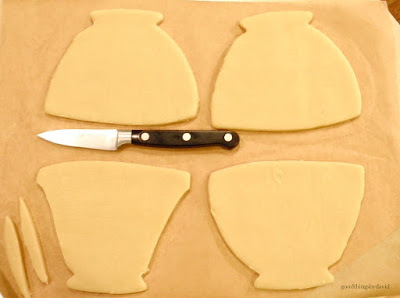 Using the same paring knife, I sliced and sculpted the rolled rim that is very prominent on yellowware bowls, and then I went down the sides, slicing off the rest of the bowl shape as shown above. The cookies were then baked and cooled. 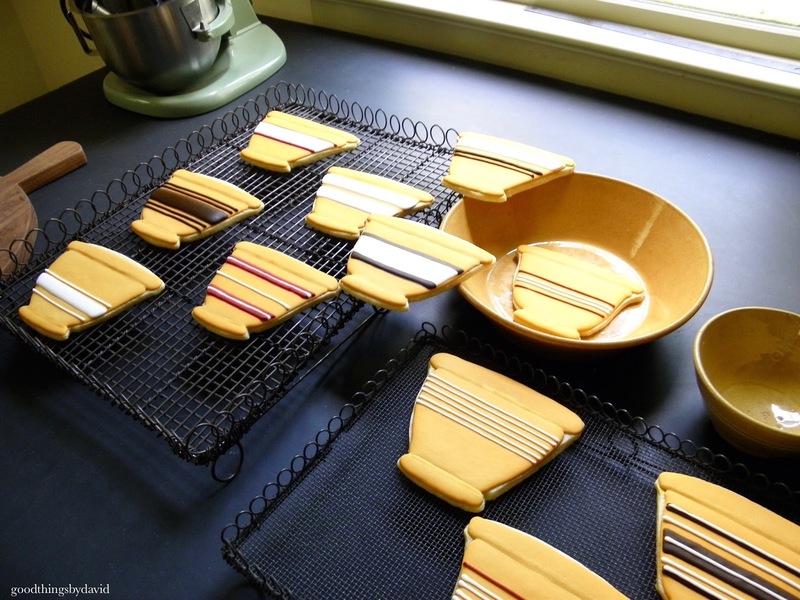 To get that rich "yellowware color", I used Americolor egg-yellow, along with a hint of Americolor copper, and Americolor brown, to tint a large batch of royal icing. There is no one true color of yellowware, for these antique pieces all have different shades. That's one of the aspects that makes them so beautiful and collectible. With a #4 plain piping tip, outline and flood the rolled rim and the footed base of each cookie, and allow to set for at least one hour. This is what will give these two areas of the cookie some dimension. 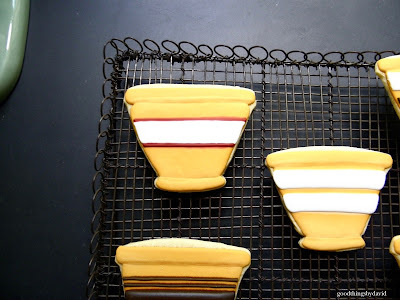 Using the same royal icing, outline and flood the body of the bowls. Let dry completely. For this entire set of cookies, I then used royal icings in white, dark red (add a few drops of black to red food coloring) and chocolate brown. Using #2 and #3 piping tips, I began to pipe stripes of colors the way potters added slips of clay to yellowware bowls at the end of the 19th century. 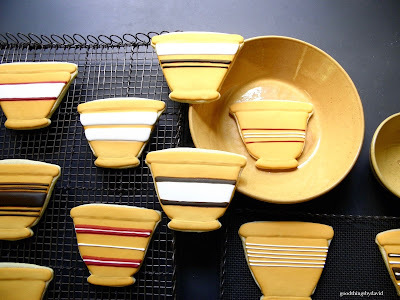 Again, I used my own collection of yellowware bowls for ideas. However, you can always do an online search for your favorite yellowware bowl designs. Whatever you decide on, let the colors set and dry completely before putting the finishing touches on them. Yellowware bowl cookies on a wirework tray. Using a pearl shade luster dust in gold and a very fine paint brush (reserve paint brushes for cookie decorating), gently apply and brush the decorating dust along the bottom of the rolled rim. Add it so that you give the rolled edge some contour. Do the same for the footed base, however, apply it at the top of the foot. By doing this contouring, you're creating the rolled edge that is unique to antique yellowware bowls. I loved every single one of these cookies, but perhaps my favorite was the red striped bowl with the large band of white. This bowl was the first piece of yellowware to ever come into my home almost twenty years ago. I can still remember the day I discovered it at a flea market near my former home in Haddonfield. If you're a collector of yellowware or know of someone who is, why not try making them some yellowware bowl sugar cookies as a surprise? With a set of these set out on nappies or milk pans from the turn of the twentieth century, they will undoubtedly make a great gift for someone special. Fall is the perfect time to bring out the yellowware from the cupboards. It's also the perfect time to make a batch of yellowware cookies. Have fun making them now that I've shown you how! Beautiful!! 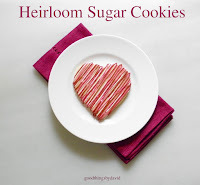 !, I continue to be inspired by your gorgeous cookies! I love browsing all your cookie posts for inspiration. 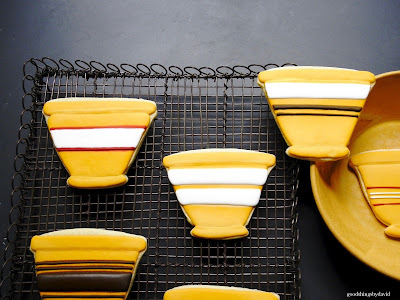 What a great use of the Martha teacup cutter!